Split pea soup has never been easier using an Instant Pot. Split pea soup is my "go-to" meal in the winter. It's hardy and delicious and a great source of fiber and plant-based protein. At less than 300 calories per generous serving, this recipe has a whopping 21 grams of dietary fiber and 19 grams of protein. But to my delight, I've created a way to make this awesome soup with absolutely no trouble at all. 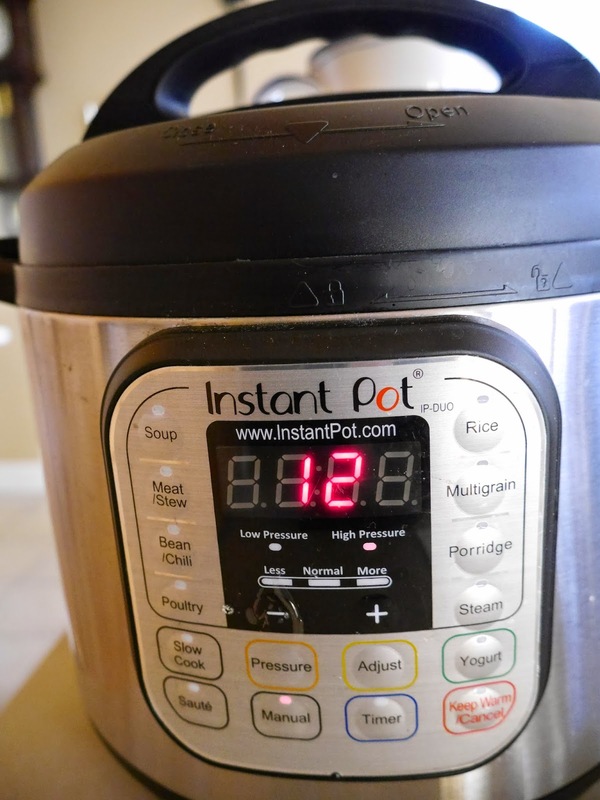 Just pop all the ingredients in an Instant Pot Electric Pressure Cooker, set for 12 minutes, and your have a pretty smooth soup without any stirring or blending. Including the heat-up time and a slow release time, it takes a total of about 1 hour with absolutely NO effort at all. After it cooks, I stir some shredded carrots into the hot broth and they cook almost instantly. Pick through the split peas for small rocks or dirt and rinse well, in a strainer, under cold water. Place the rinsed split peas in the Instant Pot along with all the rest of the ingredients except the carrots and lemon juice. Stir a bit to get the bouillon cube mixed into the hot water. I like to use water and a Rapunzel bouillon cube because it gives a nice flavor and usually provides enough salt but you can substitute the water and bouillon with veggie broth. As a note, the olive oil is added to keep the peas from frothing and clogging up the pressure cooker. Place all ingredients in the pot except carrots. Secure the lid and make sure the top vent is closed. Hit the manual button and set for 12 minutes. When done, let the pressure release naturally. When complete, remove the lid carefully, with the steam pointed towards the back. Add the shredded carrots immediately and stir well until the soup is smooth. It may seem a bit thin but this soup thickens as it cools. Adjust for seasonings, adding salt to taste and additional black pepper if needed. To brighten the taste, you can also stir in a tablespoon or two of freshly squeezed lemon juice. Do not shred the carrots too thinly. The shredded carrots will cook immediately in the hot soup. When you put the leftover soup in the refrigerator it will become solid. To reheat, you may need to add additional water. (Per serving - 6) 291 calories, 2 g total fat, 0.7 g saturated fat, 70 mg omega-3 and 427 mg omega-6 fatty acids, 0 mg cholesterol, 19 g protein, 50 g carbohydrates, 21 g dietary fiber, and 379 mg sodium. Thank you for this recipe. It was so easy to follow and easy to modify. I absolutely love my InstantPot, and collecting recipes that truly work are my current "thing". Thank you for sharing, and let me know if you would like your recipe reprinted with your blog's credit on my blog, MyAllergyAdvocate.wordpress.com. Feel free to share any of my recipes! If I want to use big chunks of carrot, can I put them in at the start? Yes you can if you use chunks or thick slices. In fact, I do that now when I'm too lazy to shred and in the next edition of Health Begins in the Kitchen, which will have many IP recipes including this one, I put the carrots in right away. I made this and it was very good. I did add an extra bullion cube, one potato, extra onion and garlic powder, extra salt and pepper, and the juice of one whole lemon. Garnished with green onions and paired with saltine crackers. So yummy! Glad you enjoyed it Stephie. Thanks for the feedback! I've made this excellent recipe several times. chopped garlic (I use three teaspoons), black pepper, sage, fish sauce (2 tbls), and Goya Sazonador Total. I adapted this recipe into CARROT SPLIT PEA SOUP. Quantities for 8 quart Instant Pot. 1 1/2 lbs split peas. One quart carrot juice, 2 quarts salt free chicken broth, ½ lb Polish sausage or ham, finely chopped, 2 chopped onions, 3 stalks sliced celery, improvised herbs (1/2 ts each GarlicPlus, marjoram, Mrs Dash, pepper, whatever) then 16 minutes soup setting in Instant Pot. After cooking a good stir to blend and thicken. Easy and a great result.